Alberta Water Nexus Project: Which way? Right way? In early 2017 the Alberta WaterPortal began work on Phase II of the Alberta Water Nexus Project. Phase I of the project was completed in 2016, and focused on identifying and understanding converging water use within the Bow River Basin through case studies and an online decision making simulator. The various activities from the Workshop are outlined below. 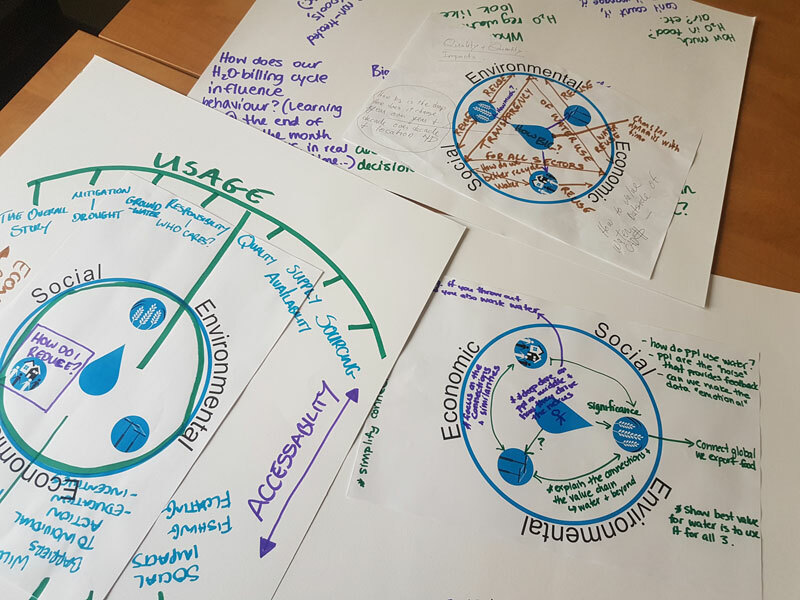 Also included are a few of the creations that our thoughtful and energetic participants came up with, and some of the key themes and outcomes. Participants were given an envelope filled with props including cut out images of objects, activities, and scenes. A few examples include a battery, fresh produce, a community, and a toothbrush. Participants were asked to draw the Nexus on blank white poster paper, using the props and writing materials. Activity 2: Where to dive in and what to find? Following a presentation on the concept of the Nexus in Alberta and previous work completed by the Alberta WaterPortal Society, participants were again given a blank board, some props, and writing utensils. This time participants were asked to discuss what was of key interest to them and others with respect to the Nexus landscape, and what information/data could support learning more. How would you make this relevant to an Alberta homeowner? How was your overall experience of the simulator? What did you like? What would you improve? Screenshot of the current Alberta Water Nexus Simulation tool. A closing roundtable gave each participant the opportunity to share their experience at the Workshop and a few key takeaways on the Nexus in Alberta. 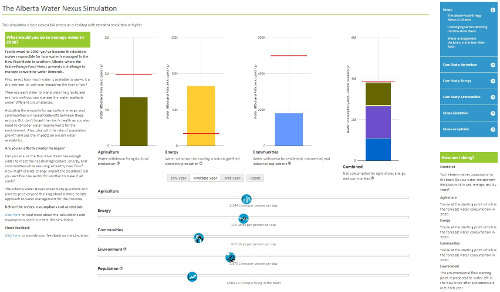 Visit the phase 1 simulator to move the sliders and watch how your decisions impact water for each of the different sectors. Visit the phase 2 simulator to see the improvements made based on this feedback. Communities are central to the Alberta Water Nexus. It’s a balancing act – different values and priorities between sectors will create perpetual push and pull within the Nexus, while economics and policy balance the push and pull. Different stakeholders of the Nexus have different priorities, but many base values and interests are the same. A greater scope of data is needed to understand the Nexus that incorporates both water quality and quantity, including current local water balance data and future projections driven by changes in technology and climate change. Connections between the Nexus at different scales – global to local – are important to understand the full context of the Nexus. Individual decisions cumulatively impact the Nexus. Results of the simulator could be made more functionally relevant to different users of the simulator. E.g. adding consequences to user decisions, using example scenarios that are relevant to homeowners. Visual aesthetic and user experience could be refined further. E.g. using more visually engaging graphics like icons or photos, changing combined bar graph to pie graph. Purpose and audience of the simulator could be defined more clearly. E.g. increasing clarity of the objective and challenge to be solved. 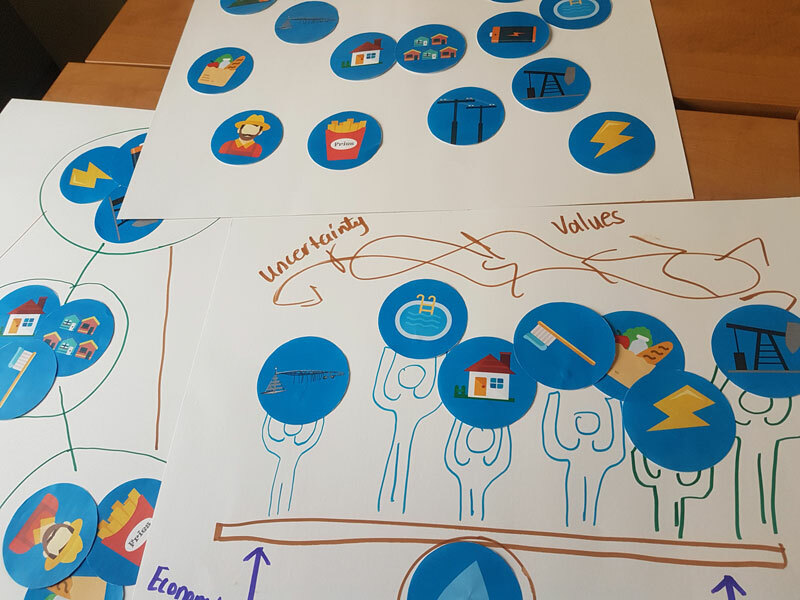 By hosting the Workshop, Alberta WaterPortal gained a deeper understanding of how Albertans think about the Water-Energy-Food-Nexus, as well as some new perspectives on the relationships between the different players in the Nexus. Working through the activities with participants, we were reminded that with every relationship, there is a story, and that stories are what inspire connections and meaningful communication. The Alberta WaterPortal also realized that communities play a central role in the Nexus by making the choices that create the perpetual push and pull. This new appreciation for the importance of communities as major drivers of the Nexus will inform the next phase of work, focusing on socio-economic impacts and making the simulator relevant to homeowners in Alberta. The Workshop was a unique opportunity for many of the participants, offering the chance to share opinions with a diverse group of individuals who share common values but occupy different spaces within the Alberta Water Nexus. In addition to wanting to go further and dive deeper, most workshop participants reported an increased understanding of the Alberta Water-Energy-Food-Nexus and felt they had the opportunity to provide valuable input into the Project. There are places in the world where such a diverse group of individuals couldn’t be in the same room together discussing water, let alone such a complex, emotionally charged concept as the Nexus. For our workshop participants to feel that they had a chance to speak and be heard is one of the most valuable outcomes of all. The Alberta WaterPortal would like to thank all participants once again for their enthusiasm and honesty throughout the Workshop. …and many others for your participation! *Special thanks to the University of Calgary for hosting the event.